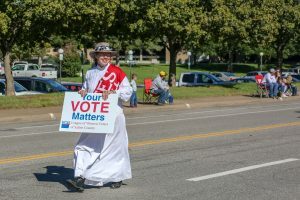 The League of Women Voters of Kansas registers voters and encourages active participation in the democratic process. The new voter registration laws can be confusing. If you are having problems navigating the system, either registering or voting, the League would like to hear your story. We are serious about protecting every citizen’s right to vote. We will help you or find someone with answers. We will also advocate for changes needed to streamline the process. Please tell us your story. Am I registered to vote? You should receive a voter card in the mail when your registration is official. You can also check your registration online. I completed my registration but I’m not on the voter list. What should I do? Contact your county election office and explain the problem. Do I need to provide proof of citizenship to register to vote? Documentary proof of citizenship is NOT required when registering to vote, per the Federal District Court ruling on June 18, 2018, by Judge Julie Robinson declaring the Kansas Documentary Proof of Citizenship law violated the National Voter Registration Act and the U.S. Constitution. When are the dates for this year’s elections and related deadlines? The dates and deadlines for elections are in this guide to voting. (This is the link for the 2016 guide; the 2018 guide has not been released as of June 2018). Do I have to register with a party? No. You may register with a party (Democrat, Republican, or Libertarian) or be “unaffiliated,” without a party. Can I change my party registration at the polls? If you are registered as a Democrat, Republican or Libertarian and want to change parties, you must make that change before June 1. If you are unaffiliated and want to vote in the primary election, you must declare a party affiliation at the polls in order to vote. In the general election, all parties share the same ballot so no party declaration is needed at the polls. I have moved. Do I need to cancel my Kansas voter registration? You should cancel your registration to keep the voter rolls accurate. Your registration will eventually be cancelled when election mailings are returned and you fail to vote in several general elections – but it can take several years. Send your county election office a signed and dated card or letter stating that you wish to be removed from the voter rolls in that county. Include your name and the address where you were registered. Also, if you are a victim of domestic violence, you can enroll in the “Safe at Home” program and shield your address in all your forms of government identification. For more detailed information, visit the Vote Kansas website. Contact your county election office for information related to your personal situation. Share your registration or voting difficulties via our “share your story” form.